Just to make sure you have a firm grasp on what's ahead in 2012, here are more trends to be aware of from seven more awesome musicians and experts. Remember: Success in today’s quicksand-like music business is HARD and takes WORK. Getting into a negative, overwhelmed and angry place will directly affect your success. I’ve seen it now thousands of times in 12 countries. The artists I know who manage to stay positive and who are grateful for the little wins and the small miracles are happier, more successful, and go farther than their counterparts who let it all get the best of them. These subscription-based streaming sites are great for music consumers and not so great for artists. To stay ahead of the pack, smart artists are going to have to come up with clever ways to incorporate their music and sharing on these powerful platforms that have music consumers going gaga. Sadly, this will mean less revenue from sales of music but could provide great opportunities for discovery-based creative marketers. It’s been on the horizon for a long time but smart phones are getting smarter, app developers are getting more nimble, and options more affordable. Smart musician marketers will need to have a mobile strategy moving ahead. 1. Your website – Is it clear and consistently updated? 2. Your mailing list – Is it growing? And are you sending regular communications? 3. Your products - Are you still offering music only? You better not be. I’ve been blogging my “In Defense of 1,000 True Fans” series for years. I won’t stop because this is the way that you can still achieve your goals. Is it easy? No. Is it fast? No. Does it work? YES! The smartest artists know it’s all about one-on-one fan building with authentic engagement every step of the way. I know a lot of artists say it makes them feel like carnival barkers, but fan funding is a wonderful way to make money. Of course, you need to have a loyal base of fans to achieve it (see #5). It will be more important than ever for acts to be doing live performances in order to connect with people and break through the vast amount of "noise" coming from the Internet, smartphones, and other entertainment options. Technology is great, but the pendulum is swinging in an anti-technology direction, as more and more people are discovering, despite having thousands and thousands of "connections" on Facebook and Twitter, they're more lonely than ever. In short, people want to connect with others on an authentic level and experience something that doesn't involve a screen. A live performance is the perfect solution. With that said, mobile phone technology and the growth of social media will make it easier for people to combine "real life" things, such as going to see musicians play live, with their online lives. Musicians who understand how to engage their audiences to take advantage of things such as sharing photos, audio, and video online will benefit tremendously, especially when they've developed a real world, offline community of people. 2012 should prove to be a very interesting year. We’ve seen the fall of the album, the discombobulating of the old structures and new ones trying to form. I would predict that this year will be about artists connecting direct with fans, more on this on all fronts. From website and marketing restructuring, less mystery, the walls will come down, as more direct one-to-one connections are made. I also foresee smaller venues for fan-based crowds only and fan supported records and tour support. Less about the glory of mega-fame, and more about the intimacy and appeal of mini-fame, less pockets soaking the pie, and more interdependence. It’s a new time, and a very exciting one, if we can all keep perspective and our eye on smaller spheres. People want to come together, to be a part of something with each other. It’s about professional camaraderie and community – the result from how we affect each other’s lives. Bring it on, 2012 will be a year to be remembered. 1) As the music industry continues to find its way in a dramatically changing marketplace, I believe we will see the continued shift from a "purchase model" to an "access model." Low ticket continuity programs will safeguard against illegal downloads and increase the connection (and longterm profitability) between artist and fan. 3) We will see a dramatic increase in the merging of platforms. For example, sign up for a mailing list and simultaneously link your Facebook account, or opt in to receive text message alerts, and so on. 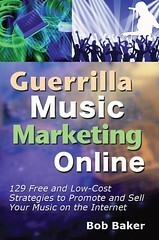 2) Direct response marketing will become an increasingly popular promotion method among musicians. It's often said in marketing circles that it's the "benefit" that people pay for, not the "features." The same is true with music. People don't want a "download," they want an "experience." Understanding that, the right direct response marketing campaign will allow artists to convert cold traffic into sales, just like every other market in the world. This is something that has been missing from music and I see rising in popularity in 2012 and beyond. In 2012, I believe the importance of mobile and location-based technologies will take off beyond the simple check-in. Mobile technology will give artists tools to have a fully realized portable business. Look no further than the food truck movement. Budding restaurateurs used geosocial technology to thrive in 2011, and independent musicians will do well to take cues from them in 2012. Artists will more efficiently manage funds while on the road. Setting up and purchasing from mobile storefronts will become more frictionless with NFC technology and products like Google Wallet and Square. As location awareness becomes more prevalent and seamless in mobile technology, artists will be more in tune with where fans are. The places you love say a lot about who you are. So if fans are able and willing to share geosocial info, musicians can perform and interact with their fans at the places their fans love the most. In 2011 I really started to see a lot more constructive discussion amongst musicians about how to actually make money. I expect that trend to reach a new level in 2012. With people like Bob Baker, Ariel Hyatt and John Oszajca leading the way, marketing for indie artists has become a more mainstream discussion that more and more people are getting involved in. A lot of people have been outspoken about how the sky has been falling ever since the advent of the MP3. I think most people have gotten over that sentiment by now and it's at the point where the prevailing attitude is getting more constructive and there's more hope for artists who want to make a career as a musician. Internet marketers had the blueprint figured out ten years ago. The problem is that internet marketing has typically attracted a very different personality type. Most internet marketers speak a different language than musicians and use strategies and tactics that would simply feel wrong to an artist. As we start to look beyond that we can see that they do have a lot of things figured out that musicians would be wise to learn from in 2012. In fact, I think that as more creative people learn some of these principles they'll actually produce some ideas that traditional internet marketers can learn a lot from themselves. I recently worked with an artist named Ali Handal to build a series of automatically generated emails for her mailing list subscribers. Instead of being over-the-top and trying to shove her CD down people's throats, we decided to use email to do some real engaging and relationship building in a way that was both fun and authentic. In the emails she tells interesting and funny stories about her career and experiences and about making her CD. By the time she actually offers her CD (on the ninth email), her fans already feel like they know her and they've heard all kinds of amazing things about what went into creating the CD. She's sold way more CDs than we could have hoped for, her open rates are consistently excellent, and she gets emails all the time from people who love her stories. This is the kind of thing we can expect to see more of in 2012. More optimism, more efficiency, more relationship building, more effective marketing, more fulfillment, and more money. 1. Online fan clubs - you deliver all your new music and videos into a private membership site and fans pay for access. There will, of course, be different payment levels for people who would like access to more content. 2. Musicians making money through ads - my experience is that one of the biggest problems musicians face is actually getting fans to pull out the cash and buy something. So why not skip that step! Just focus on producing the best music and most interesting content that will attract lots of hits to your site. Then you just put a simple Google Adsense banner in the sidebar of your site, and every time someone clicks the banner, you get paid. Not a massive amount, but it all adds up. Google Adsense will probably not pay your rent, but it’s easy to set up. The real concept here is that you attract the eyeballs and then advertising companies pay you for a share of your hits. This is how most popular websites make money, so your fans won’t think it’s strange to see an ad or two for something cool. The reason I love both of these models is that they simplify the process for you and the fans because everything is delivered online at no extra cost to you. With the ads, you don't even have to sell anything! Great new insights! We're extremely excited to get started on 2012. I'd love to find out more about the auto generated emails that Chris Rockett was talking about. Great thoughts and advices, thanks! I can most agree with Ariel Hyatt and Michael Laskow. As for gadgets and tools, I am testing now a video email system. Some might say: if you try to excel in many things, you can't be good enough in anything... Oh really? As long as your fans like your stuff of whatever art form you do, as long as you are satisfied with your own performance and creations, and as long as you enjoy doing those things - who cares? Unless your definite purpose is to be a superstar with one single thing you do. I am not saying that this is a music trend for 2012, it is my current view of looking at the subject of being an artist these times. 4. Building up several sources of income is a clever thing: there are awesome affiliate programs for example that will not ruin an artist's reputation, but make it possible for us not to HAVE TO play or sell our music. Have a creative 2012 everyone! I agree direct marketing will be the big thing of 2012. With almost any one able to connect to their friends through facebook people will want to connect to their favorite artists through it as well. I don't like the idea of auto generated emails however. Simply put, I think twitter does a much better job of it. Thanks a lot, Bob, for these two posts. All good thought-provoking stuff. What's really astonishing is the pace at which things are changing - prophets had already foreseen the coming of an all-streaming era, but I wonder if even they had expected it to arrive so quickly. My prediction, not necessarily for 2012, but sometime soon, is that things are going to slow up. We've run through all the big developments in sound, video and computing with increasing frenzy and I think at some point in the near future it will be time to take stock of where we are and what the consumer really wants. Do they really want 3D films, for example ? I don't think so. It was tried in the 1950's and if it didn't work then, it's not likely to work now after the gimmick factor has exhausted itself. Are people really satisfied with all their cyberfriends? Are they satisfied just with virtual products which they don't own? We'll see. I think David Hooper's on the right track. All the best to everybody for 2012, whatever it holds. As always Bob, another home run! I know with you I can count on the info being consistently good and I don't have to wade through the crap, you've taken that step out! Great article as is the first one of this series. Great advice. Definitely building a fan base of fans to interactive with (quality over quantity) is great and a must. Plus, the more dedicated fans you get the more other fans you will get by word of mouth. And the more people that will buy your music later on. Great post, Bob!